With the weather so cold for so much of the year, soups play a large part in Northern cuisine. 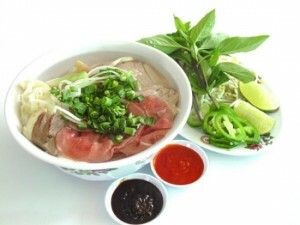 Pho, Vietnam’s ‘chicken soup,’ is made with white vermicelli noodles, sliced beef or chicken, bean sprouts, chopped peanuts, hot broth and mint leaves that is served piping hot and at all hours of the day. Pho stalls can be found all over Hanoi (and Hanoi style Pho can be found all over Vietnam, catering to homesick Hanoians) and a bowl can cost between 5,000 and 10,000 dong, depending on the location. Once the bowl is put in front of you, spice it up with bean sauce and chili sauce and squeeze in a few lime wedges; then dig in with a pair of chopsticks in one hand (to lift up the noodles to cool them off) and a spoon in the other (to lift the noodles to your mouth). Other soups include Chao, a kind of rice porridge, and it’s often prescribed as a remedy for common colds. By far the favorite food in Hanoi is ‘Bun Cha’ grilled meat eaten at makeshift restaurants serving patrons on the street. It’s a great way to fill up for just a few thousand dongs, and when walking around the city it may be impossible to resist the smell. Bia Hoi is a Hanoi invention, and ‘Bia’ comes from the English word ‘beer.’ Its freshly brewed and served in plastic jugs; its cheap, and it’s a great way to soak up Hanoi’s ambience at night and you might even make some friends along the way. Hanoians may be a reserved bunch, but they are downright adventurous when it comes to exotic food: fried silk worms, cobra meat, dog meat among others are eaten by people in the capital to cure sickness, increase virility or just because it’s the right season. Most of the food eaten in Central Vietnam has some link to the imperial kitchens of the Nguyen Emperors in Hue. Many of the spices, techniques and vegetables come straight from the tables of the emperors themselves. Imperial spring rolls are commonly eaten, as is Bun Bo Hue, a spicy beef soup that is not for the faint hearted; you may need a bottle of water nearby to wash down the chili peppers. A popular snack is Banh Beo, tiny ceramic dishes with a boiled rice cake topped with pork bits and eaten with a spoon; Drop a small amount of fish sauce (Nuoc Mam) on top and dig in. A lot of seafood is eaten here as well, and boiled crabs are a specialty. Perhaps the most exotic food eaten here is Com Hen, a cold rice dish flavored with juice from clams that live in the river near Hoi An. Other ingredients include white vermicelli noodles, chili and shrimp sauce. Its quite a difficult dish to prepare and is not for those who worry about healthy shellfish. The South of Vietnam is considered to have the best food in the country, namely because Saigon, with its increasingly wealthy inhabitants, demand the highest quality vegetables fruits meats etc, and foreign foods (even American Fast Food giants KFC are here) are increasingly common from French to Mexican to Indian. With the lush Mekong Delta so close, the fruit is very fresh and durians, pineapple, mango and star fruit all come into play in dishes as they come into season. Banh Xeo is perhaps the most famous Southern Dish, like Banh Khoai, it too is a pancake, but the dish Banh Xeo is much larger, and uses more green beans, shrimps and coconut milk. It serves more than one person, and is dipped in nuoc mam, fish sauce, after being wrapped in fresh lettuce leaves. Freshly cooked spring rolls are famous in Saigon, but the most specialized are Goi Cuon, the fresh spring rolls combining sliced cold shrimp, mint leaves, cold vermicelli noodles, and rice paper that is dipped in nuoc mam. Some Southern exotics include Hot Vit Lon, or fertilized duck egg, that is eaten with a spoon and is usually available in markets and street stalls.